But after more than six years of savage austerity measures and mass sackings, which have blighted the lives of a whole generation of people and seen unemployment skyrocket to more than 25 percent, the working class neighbourhoods of Athens and Piraeus rallied overwhelmingly to SYRIZA. SYRIZA is committed to a series of decisive reforms that include a 50 percent increase in the minimum wage; reversing the cuts to pensions; cutting regressive taxes that target workers and the poor; and, most importantly, re-establishing collective workplace agreements. These commitments combined with other polices – such as writing off much of Greece’s debt to the international banks, nationalisation of the local banks and an end to privatisations – are a direct challenge to the neoliberal agenda that has dominated Western capitalism over the last 30 years. The banks and all the key institutions of European capitalism fear that if SYRIZA is allowed to get away with implementing its platform there will be contagion. They fear that there will be an upsurge of demands to reverse course in Spain, Portugal, Italy, Ireland and other European countries that have been ravaged by austerity and cutbacks. They fear that left governments will be elected in country after country and the working class movement that has been on the defensive for so long will dramatically revive. In and of itself, SYRIZA’s electoral victory won’t be sufficient to reverse the austerity measures. SYRIZA will face ongoing opposition and sabotage from every section of the Greek and European establishment: the bankers, the media moguls, the heads of the public service, the judges, the police chiefs and the army generals. SYRIZA will only be able to implement its program in the face of this concerted opposition by mobilising its working class supporters in determined and ongoing struggle on the streets and in the workplaces. Over the past six years, Greece has had more than 30 general strikes, the movement to occupy public squares, innumerable mass marches, the encircling of the parliament building, campaigns that refused to pay increased fees and so on. These mass mobilisations and the increased radicalisation of the Greek working class associated with them laid the basis for the spectacular rise of SYRIZA. PASOK (the equivalent of the ALP), the mass party which Greek workers had traditionally supported, was utterly discredited by its imposition of vicious austerity measures while in government in the initial years of the crisis. Workers shifted to the left and abandoned PASOK in droves. It was reduced to a derisory 5 percent of the vote in the latest election. Over the last year or two, the level of struggle in Greece has significantly receded, though not entirely. The most recent general strike was held on 24 November 2014. Workers instead turned their hopes to the election of a SYRIZA government to reverse the austerity measures. However workers can’t simply wait for SYRIZA to deliver. They need to push forward with their own demands to counter ruling class resistance and to strengthen the hand of the Left Platform in SYRIZA, which is fighting to prevent any backsliding from the more moderate elements of the SYRIZA leadership. Hopefully, the confidence that workers gain from their electoral victory will open up a new round of mass struggles, fuel a further radicalisation and lead to the growth of the revolutionary left. It won’t simply be direct sabotage from the powers-that-be that SYRIZA will face. It will come under immense pressure to be “realistic”, to modify its demands, to compromise and only reverse some of the most outrageous austerity measures. If, as it currently appears likely, SYRIZA falls just short of an absolute majority in parliament it will face intense pressure to form a coalition government with one of the small bourgeois parties, such as Potami or the right wing nationalist Independent Greeks. This would be a tragic mistake as it would leave SYRIZA open to ongoing blackmail that their “ally” would bring down the government if SYRIZA did not moderate some of its most left wing pro-worker policies. 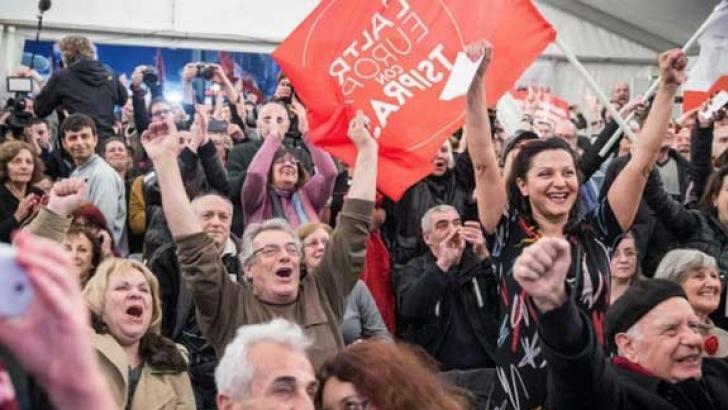 It would be possible to form a clear majority left government if SYRIZA obtained the support of the still sizeable Greek Communist Party (KKE) which won more than 5 percent of the vote. Unfortunately, up until now the hardline Stalinist KKE has adopted a highly sectarian approach to SYRIZA, condemning it as more dangerous to the working class than even the openly right wing parties. However in the face of the enormous working class enthusiasm for a SYRIZA government, the KKE will undoubtedly be challenged by militant workers to modify its sectarian approach and allow SYRIZA a chance to govern. A great deal is at stake. The outcome is important not just for workers, the poor and the oppressed in Greece but right across Europe, where workers have faced cutbacks, mass unemployment and falling wages as the capitalists and their governments moved to shore up their profits in the wake of the 2008 financial crisis. Across Europe, whenever the social democratic/Labor parties have been in government they have defended the interests of the bosses by implementing austerity measures. Meanwhile, the top trade union leaders have stood by and refused to mount anything like the scale of resistance necessary to turn the tide. Now a left government is set to come to office committed to defying the bankers and the neoliberal capitalist orthodoxy. Workers all across the continent will be watching these developments closely and with great anticipation. If SYRIZA does not back down and pushes ahead with its anti-austerity program, that will raise hopes and aspirations throughout Europe and could trigger a sharp swing to the left. SYRIZA’s victory is an exciting development in the ongoing class war, but nothing is guaranteed. It is impossible to predict the exact course of events over coming months, but what is crystal clear is that the rich and powerful won’t give up without a monumental struggle by our side.